And it’s not just in the United Kingdom where libraries are morphing into something else . . . if not dying out completely. I’ve seen numerous articles about the demise of them in the United States, whether it’s the closure of branches in Boston, reduced hours in Los Angeles, or the architectural makeovers that render library books merely decorative, as in Cambridge, Massachusetts. 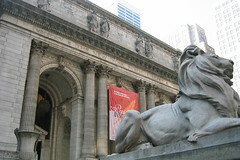 Image: NYC-Midtown: New York Public Library Main Building via Flickr under a Creative Commons License. I wanted to share the website for the Vigo county public library here in Terre Haute, IN. I greatly enjoy your writing! The barbarians are truly within the gates. I just now read the latest news from our local library, which warns us (again!) that our wonderful new governor wants to cut our libraries’ funding by 74% — yes, that is his order to the legislature, who, we can but pray, will refuse. That is even a more draconian cut than those to our schools,which I had not thought possible. In the days when the “Know-nothings” were in the political saddle, our libraries actually grew! Good Lord, deliver us from Republicans. I couldn’t agree more. I am an economist by training, but at one point in my academic career (in the middle of a heinous PhD experience, to be precise) I completed a graduate program in library studies. I was disillusioned with economics at the time (I wonder why?) and given a lifelong love of libraries I had an interest in becoming an archivist or even an academic librarian. Before completing the program I realized that I was better off as an economist. If a librarian, I recognized that I’d either be fighting the closure of libraries, deep budget cuts, or managing the transfer of material to newer electronic media (or negotiating contracts for large databases of academic journals). I mourn sincerely the slow demise of the cultural institution that provided so much nurture to me as a child, youth and young woman. I was in one of my favorite (chain) bookstores the other day, thinking about the library in my small home town near Boston. The near daily pilgrimages when I was a child, to sit surrounded by books. Reading, your read to. I looked around the chain store, and what I saw was part of the equation of our loss of library time. Bookstores, encouraging us to linger (so we may purchase), now such an accepted part of our landscape not only for commercial purposes but to sit and read, to sit and work, and do so for hours. We sip our coffee, occasionally meet people who are interesting, we are allowed to make ourselves comfortable on the floor, leaning against the stacks, and thumbing through a book of poetry. No one disturbs us. There isn’t the same reverence as in a library, and you cannot leave with the book unless you pay for it, but it is still a place of print and paper and community. Something not yet replaced by the Internet. Something good, but not without its price. And I don’t mean money. Agree that bookstores sort of half fill the void. But there is the underlying commercialization vibe you note (coming soon: a post on the commercialization of reading!) Thanks for dropping by! Excellent piece, Delia, thanks. In Washington DC my local library was just, well, gross. There was no place anywhere to sit and read in even semi-privacy, it was run-down, noisy as a bus station, and all the reading chairs were taken up by napping homeless people. The other DC library I could get to fairly easily burned down. The problem isn’t just Washington DC, of course. Many urban libraries lack funds and grapple with the issue of how to remain a library, open to the public, and not turn into Homeless Magnet Central? It’s a public space, so the homeless, like any other citizens, should be welcome. (And I very much agree with your point that good public libraries can help make us all better citizens.) The problem is, not all but many homeless people come not for the books, but to nap and use the facilities. Also,many are mentally unstable (a terrible challenge for the library’s staff) and they frighten off the very people who would like to use the space for what it is: a library. No doubt, some homeless people are perfectly sane and they do use the library to read and research. That said, alas, while in DC, I more often than not, I end up at the Barnes & Noble. On a more positive note: a neighborhood group has recently started to organize a “friends of the library” campaign which looks promising. Agree that homeless problem is an issue, @CM. We have that here, even in my Keatsian branch. It’s a shame and the outgrowth of a different social problem, of course. Again, runs to @biglittlewolf’s point that, increasingly, book stores are serving the function of acting as quasi-libraries (with attendant commercialization of the reading experience which flows from that). Thanks for your comments. Great story, Delia. I agree with everything you wrote. My first part-time job when I turned 16 was at a local Boston library, and I worked my way through high school there. Now as a mother, I can’t think of any institution outside school that is more important to introduce to my son. Our weekly visits have been instrumental in helping him develop his love for reading. I’m so, so grateful that in our town our already good library is actually undergoing a major *expansion,* but I feel very sad for what is happening to libraries in general. I’m saddened enough as it is with the idea that people now read books on machines…I guess I shouldn’t be surprised that libraries are next on the chopping block! Thank you Cecilia. It is an integral part of our family life as well! My local library is one of the places I go when I get (less often lately) homesick for the US – it seemed like familiar territory. Mind, a do see a lot of unhelpful council employee staff – they are rather institutionalised I think, so having to become useful isn’t always bad thing! The recession will have a lot of knock on effects and I can see that libraries are vulnerable. Not sure if it is a ‘statutory’ or ‘non-statutory’ function of the local council, but if the latter, library services (and all others) are certain to be slashed, painful as it will be.